A couple of days ago, Chinese giant Xiaomi held an event, where it unveiled its new phablet — the Xiaomi Mi Max — and a pretty major update to its operating system, the Android-based MIUI. However, there was a 3rd announcement that was supposed to happen but didn't, due to last-minute issues with mass production. Fans probably already know that we are talking about the Mi Band 2. The reiteration of Xiaomi's fitness tracker, which sold pretty well all around the world due to its incredible price-to-value ratio. To recap – the original Mi Band 1 was a pretty adequate, water-proof, long-lasting activity band that had the measly price-tag of $15.Then, the Mi Band 1S added a resting heart-rate monitor, but still remained at $15. 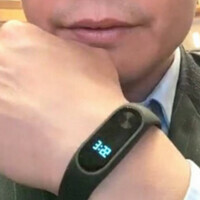 The Mi Band 2, as seen on photos, will add an actual display to the overall equation, which will, supposedly, be used to show the time, steps, heart rate, and, of course, remaining battery. About a week before the actual Mi Max event, however the CEO of partner company Huami, Huang Wang, said that the manufacturing process has been hampered by “problems”, and that the company will not be able to supply Xiaomi with enough stock in time for the planned launch. CEO of Xiaomi, Lei Jun, acknowledged this report, but said that it will only take a month before things are sorted. Now, Mr. Jun took to Chinese social media Weibo to confirm that everything is back on track, and the Mi Band 2 will launch in early June. The Mi Band is still the only product that Xiaomi officially sells worldwide. While the company has promised that its Mi 5 flagship will land in the US, and possibly Europe, it seems that it may still take a few months for it to do so. Meanwhile, we may get to enjoy another bargain-priced product – the Mi Band 2 will, supposedly, still cost $15, despite the slight upgrade.